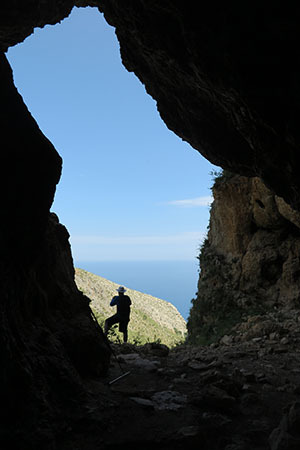 All Uzzo cave, also known as a large cave due to its size, (deep 45 mt and wide 50) is reached from the North entrance of the Riserva naturale dello Zingaro, along the coastal path. After about 20 minutes of walking, passed the first cove of Tonnarella dell'Uzzo, the cave appears to us as a fascinating millennial mystery. A curtain of trees and shrubs protect it from the wind, it immediately transmits to us a sense of protection that even our ancestors must have lived. La Uzzo cavein fact, it sinks its roots in prehistoric times, to testify it, in addition to the archaeological research and the objects found, exposed to the Salinas Museum in Palermo, a series of graffiti engraved on the rocky walls inside, visible to all. We enter and the sea outside seems very far away. Cala dell'Uzzo it is instead below us. In ancient times, the sea reached the cavities of the cave while today its stones glisten with the humidity of the night. Mammoths, elephants, lions and rhinos. In addition to the remains of extinct animals, human remains dating back to about 10.000 years ago have been found, through which it was possible to reconstruct the life habits of those who lived in these places. Community of hunters attracted by the high quantity of animal species to hunt, they initially settled in the cave. Over the centuries our ancestors learned to cultivate the land and to eat fish, thanks to the sea very close by. 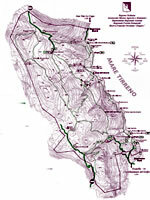 But the Uzzo cave is only the most visible of the Reserve, higher up, in the gully than from the Borgo Cusenza down to the Cala della Tonnarella Uzzo, there is the Cave of Mastro Peppe Siino, a window on the sea. At the latter, which takes its name from the owner, there was even a millstone for wheat, an oven and a press, so as to be able to accommodate the community for a long time, in case of danger. During the war, many families from neighboring villages (Borgo Cusenza and Contrada Sughero) used the two caves as a shelter, especially during the day. A third cave is located in the district of Cork, in the belly of the earth that opens up and seems to want to swallow. Captured the submerged cavities from its depth ... the sea once again dictates the boundary between the visible and the invisible. Water caveCave of the Colombaccio, Capreria cave, Mustia cave, Corvina cave and Ficarella cave. At about 2 mt. of depth, through a narrow slit, the cave of the Colombaccio welcomes us with its elegant stalactites formed by the falling of fresh water drops that make space in the rock. 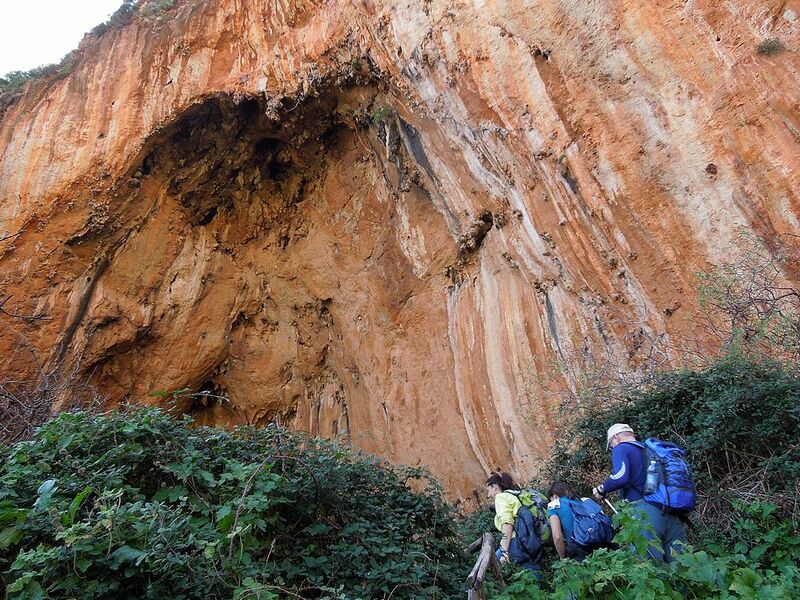 La cave of Capreria, a narrow tunnel on the surface, which opens with an oblique rocky crack, from which the light penetrates. La Mustia cave, similar in shape and position to the previous one. La Corvina cave wider than the previous ones, it is composed of three rooms, separated by rock ledges and boulders. It has two inputs. One almost on the surface which is accessed by an emerged cavity that leads to the second chamber, external, whose bottom leads gently to the third chamber. The other entrance to the cave, for the more experienced, is at a depth of about 7 mt. The three rooms almost do not see the light of day. Visible therefore in total darkness. 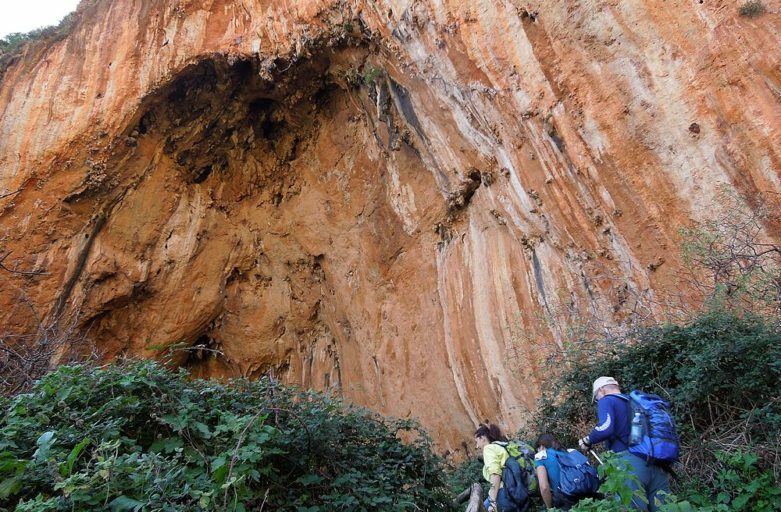 In Ficarella, from which it takes its name, there is the largest cave of the backdrops of the Reserve. At a depth of 14 mt. it has an extremely reduced brightness. A large boulder inside, beyond which you enter a large tunnel that reaches almost the surface. There Ficarella cave at the bottom, it reaches about 18 mt and ends in a blind background. The light trapped by the rock has no escape. The sea of ​​the Zingaro promises beauties and charms to the divers. The transparency of its waters reveals the depths, the life of fish and plants that creep in the submerged caves. A paradise for scuba divers who, at all frightened by the darkness, explore worlds hidden in the sunlight.